"Fresh salmon is stuffed with herbs and onions, wrapped in aluminum foil, and slow-roasted, resulting in an elegant and absolutely delicious dish that looks stunning on a buffet. Garnish with fresh herbs, lemon slices, and capers. I usually put a small wedge of tomato in the mouth and a caper or slice of stuffed olive over the eye." Preheat the oven to 250 degrees F (120 degrees C). Spread out a long piece of aluminum foil long enough to wrap the fish completely. Rub generously with a few pieces of butter. 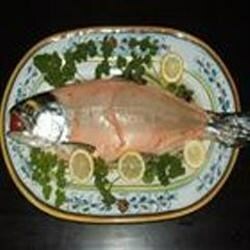 Place fish on top and spread onion slices in a thin layer inside the cavity of the fish. Arrange the remaining butter on top of the onion. Distribute tarragon, dill, and bay leaves over the salmon. Wrap aluminum foil around the fish loosely but securely, folding seams together so that juices do not leak. Place packet on a large baking pan. Bake in the preheated oven until fish flakes easily with a fork, about 2 1/2 hours. Remove salmon from oven and let cool in the aluminum foil, at least 15 minutes. Gently tear the packet away from the bottom of the fish and transfer fish to a platter. Peel skin off gently using a fork.